Karen House : Dec. 3, 2018, 5:20 p.m.
Dec. 3, 2018 – A deputy with the Sequatchie County Sheriff's Department (SCSD) is on unpaid administrative leave after being arrested for driving under the influence (DUI) by the Dunlap Police Department (DPD) Saturday, Dec. 1. And it turns out, he has been in trouble before in a different jurisdiction. Dep. 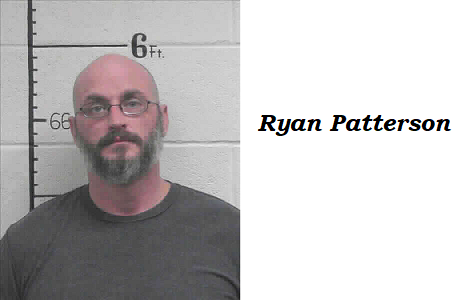 Ryan Keith Patterson, 39, of Dunlap, was arrested just after midnight Saturday morning when a city officer on patrol found him asleep in a car with the engine running and the lights on. Following a field sobriety test, the city police officer took Patterson to the Sequatchie County Jail, where he was asked to submit to a blood alcohol test, but he refused. He was booked on charges of DUI, implied consent, and open container, and was released on bond later the same day, Huth said. In August of 2013, when Patterson was working as a police officer for the city of Soddy-Daisy in Hamilton County, he was charged in a road rage incident. Although the charges were dropped, he was reassigned to the city's Public Works Department. According to a news account of the incident, Patterson was on his way home from a party at about 3 a. m. on a Saturday with two women in his vehicle when he became angry with the actions of another motorist. He followed the woman home, and when the two women with him got in a fight with the woman motorist, her husband held them all at gunpoint until police arrived. Although Patterson had been drinking at the party, he was not above the legal level of blood alcohol for driving. Sequatchie County Sheriff Coy Swanger stated Monday that Patterson has been placed on unpaid administrative leave, awaiting the outcome of the department's internal investigation. If the charges prove true, Swanger said Patterson will be disciplined, but he would not say what form that discipline would take. “That decision will fall to me, as far as where to move on from here,” he said. Swanger said Patterson had worked the night shift Wednesday and Thursday, and got off work Friday morning, a day before being arrested Saturday morning. Patterson was hired under former Sheriff Ronnie Hitchcock and had been with the department just a little over two years. Patterson is scheduled to appear in City Court Feb. 28, but Chief Huth said the case may be moved to General Sessions Court to allow the District Attorney's Office to handle prosecution.